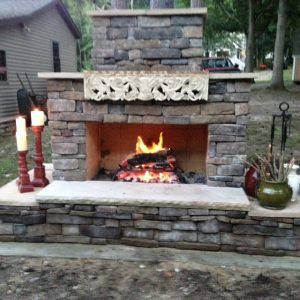 There are some great ways to finish your outdoor fireplace. 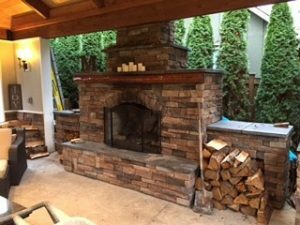 Basically, there are endless of ways to add the finishing touches which will make your outdoor fireplace a one of a kind. Even if you build the basic rough structure that another person constructed, yours will look different. If you pay attention to detail, your fireplace and backyard landscape can look like something in a magazine. We will cover five of the big finishing touches and things you can do to give your fireplace the wow factor. 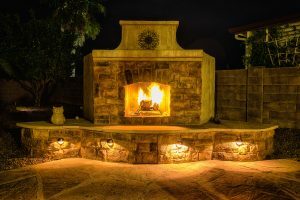 Even when the fireplace is not being used, low voltage lighting is a great way to add a great night time visual aspect to it. The lighting is powered by a transformer specifically designed for these types of lights. 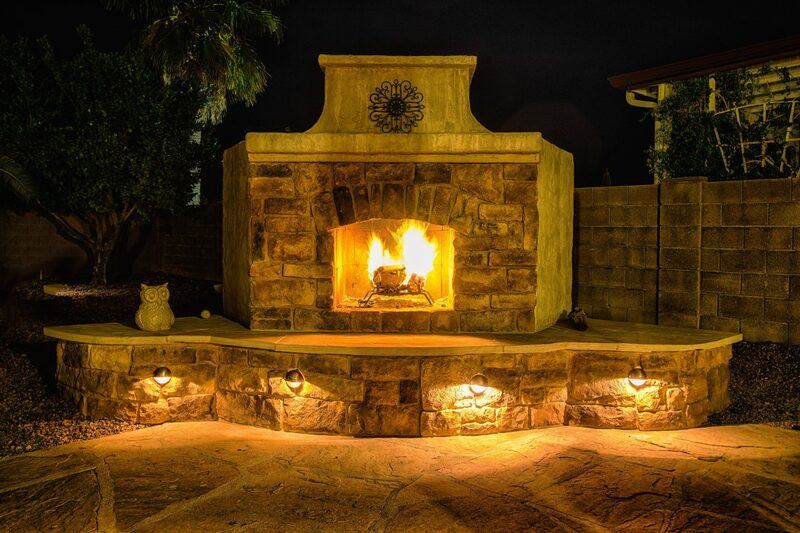 By connecting the fireplace lights to landscape lighting in your yard, everything will be illuminated at the same time. By using a natural stone material for the seating, you will have a very durable, and inexpensive surface. There are a couple widely used stone options, such as flagstone and bluestone. Both can be purchased at landscape supply retailers and you will have tons of colors and patterns to choose from. Cutting the stone is as simple as using a diamond blade for a smooth edge or a chisel and hammer for a rough rustic edge. Natural stone was used for the seating surface, shelves, and top. Stacked stone is a great way to finished the vertical surfaces of the fireplace, but it can be somewhat expensive as compared to other finish options. This type of material is purchased in arrangements that will fit together seamlessly. The stone is real and engineered during the cut process, meaning that it will be very easy to install. Cutting this stone will take a bit more time and patience as it is sometimes brittle. Stacked stone added to the fireplace hearth. 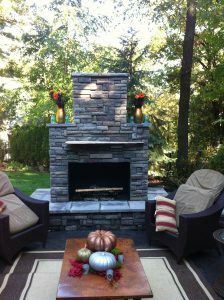 Faux veneer is a fabulous way to add a cheaper finish to the outside of your fireplace than natural stone. The great thing about faux veneer is that you can find virtually any texture, color, shape, and size imaginable. The faux stone is basically a manmade product that is painted and finished to look just like a real material. The faux stone is very easy to cut but it may take a bit of extra time fitting it together. There is no “one way” to put it together most of the time, so using your Tetris skills will come in handy. Faux veneer will usually require corner pieces that will give you a great finished look as the material wraps from one vertical surface to another. DIY built fireplace with faux veneer. Wrought iron accents will add both a décor and some functionality to your fireplace. First, add an elevated fire grate in your firebox. This will both give you a great look, but it will aid in keeping your burning wood elevated for proper air flow. Fireplace tools will give you the capability of working and stoking your fire as you need to. Many tools sets will come with a holder as well keeping it nice and neat. Adding wrought iron definitely adds character. Well there you go, five considerations that if done right, will set your fireplace on a pedestal. You don’t have to do them all to achieve a great look, but they certainly won’t hurt. 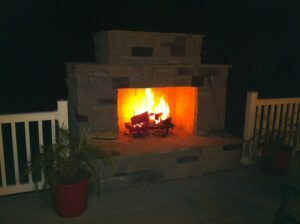 If you want to build your own outdoor fireplace, check out www.backyardflare.com for some great ideas and inspiration. We are sure you will get a vision for how you can transform your backyard into a great destination. The latest fireplace profile comes to you from South Carolina. Builder and homeowner Nick had plans of building a dream backyard and he contacted Backyard Flare, LLC for help. Nick is a DIY enthusiast and he knew he could build his own outdoor fireplace. He chose the Douglas design and got his construction plan from Backyard Flare. 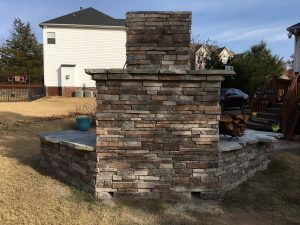 DIY fireplace built in South Carolina using a Backyard Flare DIY construction plan. 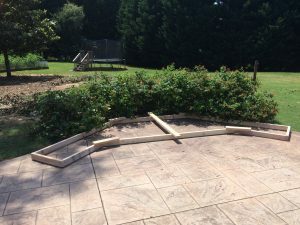 Nick had an existing stamped concrete patio in his backyard with a small flowering garden on one corner. The patio wasn’t designed or constructed with weight bearing in mind so Nick poured an additional slab for the fireplace. Nick built a wood frame to see the footprint of the structure as well. Nick had a bunch of bushes to remove. 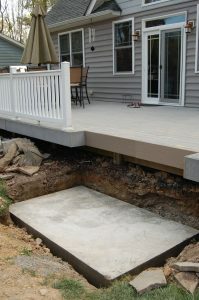 Drainage was added to the slab so that water would not accumulate. This is a very smart move when building a non-linear structure. The drainage was built through the entire slab so any water drained behind the structure. The cinder block work was started with the wing walls built to the same height as the main seating section. The normal Douglas design has the side extensions higher than the center seating section so this modification was Nick’s vision. Nick finished the rough build phase of construction. The entire structure was built in rough form, then it was time for veneer and finish work. Nick covered the horizontal surfaces with a neutral flagstone. The edges were left rough for a great outdoor look. Nick chose a great looking faux stone with a relatively small pattern. The pieces were not all the same size so there was a bit of puzzle piecing the veneer together. This task slows down the construction but it makes for a great looking veneer pattern. Nick added flagstone for the seating and a great looking veneer to the vertical surfaces. After the construction was completed, Nick added a couple colored deck chairs and a rustic piece of log for a small “beer holder”. The chimney was adorned with a great looking wreath and a log holder was added for spare firewood. Nick used veneer on the backside of the fireplace for complete finished look. 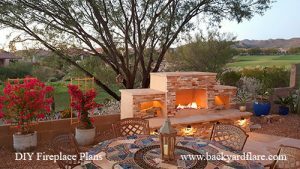 If you would like to explore the possibility of building an outdoor structure such as a fireplace or outdoor kitchen visit us at www.backyardflare.com. We will help you with all your design needs so most of the guess work will be taken out of it for you. Thanks for reading and we hope to hear from you. Happy building! This week’s backyard profile goes out to Adam in the great state of Washington. 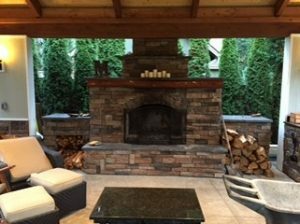 What a great job Adam did, building his stunning outdoor living area, with the help of Backyard Flare and their design team. 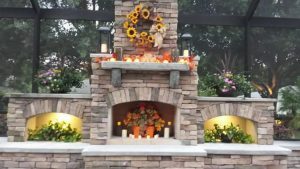 But… Adam went the extra mile and he constructed an outdoor destination complete with a fireplace, outdoor kitchen, and patio cover on steroids. 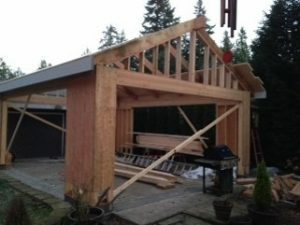 The blank slate started with the building of the wood framed pergola. A pitched roof with a decorative underbelly and drop lights covered a large footprint. This cover offered the living area with a respite from the sun or the probable Washington State rainfall. 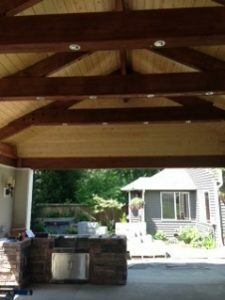 The support beams of the patio cover were stained darker than the wood slats. What a great look. Brilliant white trim accented the beautiful gray tone siding and then fantastic light sconces were set on the vertical corner sections. These lights provided ample light and amazing ambiance for the outside of the patio cover. A rugged transition to the ground was accomplished by covering the bottoms of the corner pillars a great faux stone veneer. 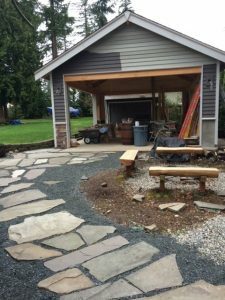 Flagstone was laid in an erratic pattern to form the approach to the covered patio. The earth tone colored stone was broken into large sections and then placed into the soil. One corner of the structure was used as a partial wall for a very large outdoor kitchen. 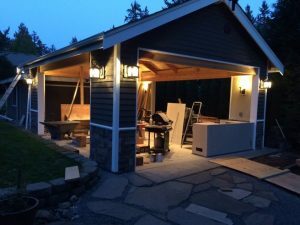 The structure was then equipped with a stainless-steel drop in barbecue grill, stainless access door, and several linear feet of counter top for cooking preparation. 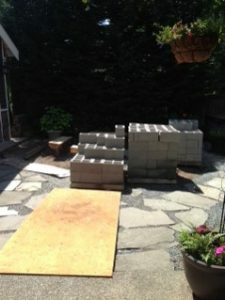 Afterward, lots of cinder block was delivered for the Backyard Flare designed fireplace. 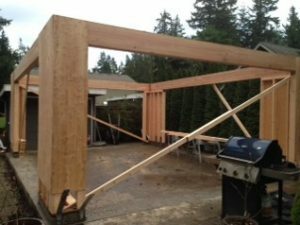 Adam used the construction plan from Backyard Flare to build his fireplace structure with ground level storage voids. Subsequently, these storage voids worked well aesthetically on each side. After the cinder block rough build was completed to the top of the two-tiered chimney stack, the veneer was then applied. This veneer matched the veneer used on the outdoor kitchen and the bottoms of the patio pillars which added a great overall look. The horizontal surfaces of the fireplace were covered with a dark stone, complimenting the veneer perfectly. A mantel was added to the front width of the fireplace and then veneer was added to the structure. Adam took a blank section of his yard and then transformed it into a very welcoming outdoor living area. I’m sure he and his family and friends have spent many days and nights making great memories. 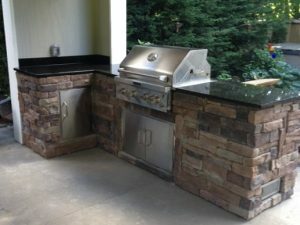 If you would like to build an outdoor structure such as a fireplace or outdoor kitchen visit us at www.backyardflare.com. We will help you with all your design needs and can take most of the guess work out of it. Thanks for reading and we hope to hear from you. Happy building! Each week we are going to pick a Backyard Flare designed fireplace built by a DIY homeowner enthusiast. We will then give you a DIY outdoor fireplace build review to dissect it regarding the construction and finish work. 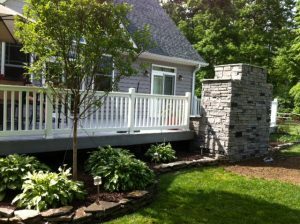 We hope you are inspired and that you realize that you too can complete this type of backyard project. DIY fireplace building is achievable for even the average homeowner and the materials are readily available at retailers in your area. The knowledge of how to “put it all together” is accessible if you know where to look. Some of these amazing structures look as if they should only belong at a fine 5-star resort, but that’s not so. 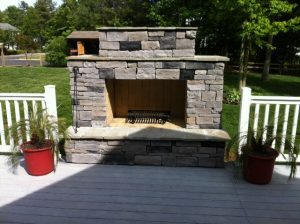 Our featured fireplace, built by Gene, is located in the great state of Maryland. 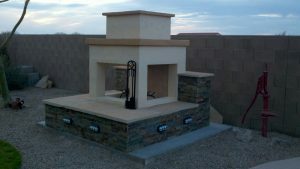 Gene approached Backyard Flare with a design idea and fireplace concept that became known as the Prescott Fireplace. Gene wanted his fireplace to be raised to the level of his deck, which was approximately 3 feet. A wide firebox and matching wide chimney was desired. After getting the construction plans, Gene started building. He first cut a section of the railing and deck out so the fireplace could be built into the deck. This would make it appear that the deck surrounded the base of the fireplace. Gene then excavated a bit of ground just outside the perimeter of his deck posts. 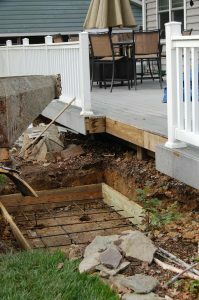 Height concerns were taken into consideration while pouring the foundation slab so the mortared blocks would reach the level of the deck perfectly. At no time was the fireplace structure to support the deck or come in contact with it. Gene made sure to use rebar in a grid pattern to pour his needed thickness of concrete taking into consideration factors such as frost line, ground prep, runoff, soil type, and undermining. This will be different for different geographical areas. Premixed concrete brought in on a trailer was used to pour the slab resulting in a beautiful foundation. Not much finishing needed to be done because the block work would be covering the newly poured pavement. Work was done on the edge of the deck to perfect it. The gaps around the slab would ultimately be filled in with dirt once the first few rows of block were mortared in place. With the block work started, Gene quickly built upward until he reached the height of the deck. The structure was set back a couple inches so the veneer could be applied down the front face of the fireplace. Once the structure was completed in rough form with the appropriate chimney measurements and dimensions, the finish work was planned. Lots of possibilities were posed and a few were chosen. The structure’s vertical surfaces were covered in a beautiful faux veneer which looked great with the accented dark pieces. The horizontal surfaces were covered with a thin earth tone colored flagstone that worked well with the color of the veneer. Mortar was used between these stone pieces thus giving it a nice finished look. Landscape was completed around the finished structure which gave this space an amazing final look. An elevated fire grate was added to the firebox and fireplace tools were bought to manage the fire. 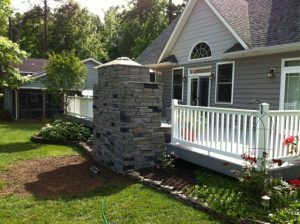 Gene did a great job on his outdoor fireplace and made us here at Backyard Flare, LLC very proud. 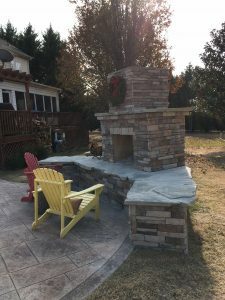 We’re hoping this DIY outdoor fireplace build review inspired you and that you consider this type of outdoor project. 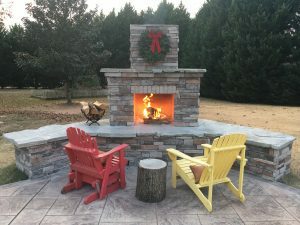 Visit us at www.backyardflare.com if you would like to build your own outdoor fireplace and would like more information about how it’s done. 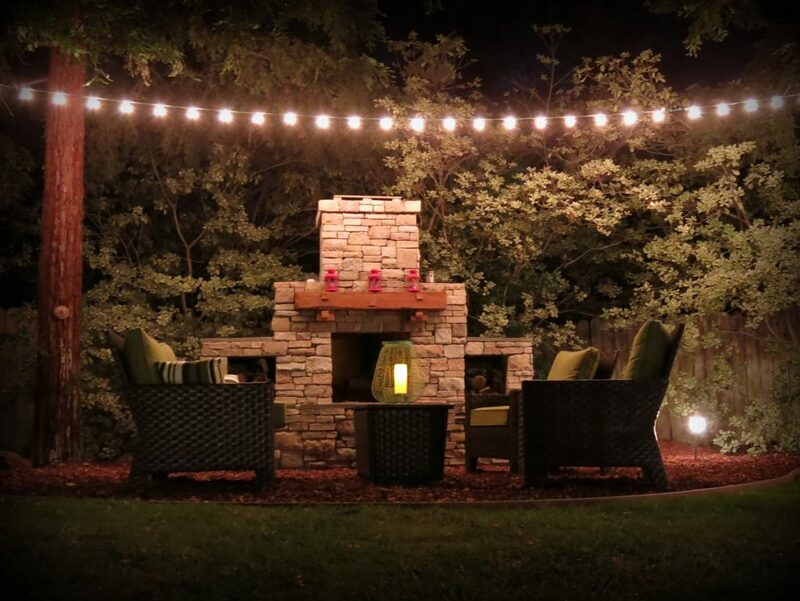 Build a focal point in your backyard. 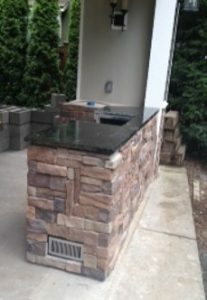 Outdoor fireplace design was on my mind from the beginning but how it happened was luck on my part. Sometimes an opportunity to step into the do it yourself (DIY) world leads to a fantastic learning experience and you have to grab it by the horns. I was standing in my house years ago looking out the window into my backyard and I knew something was missing. We had even worked on the backyard for a couple years and felt done. I walked out the sliding glass door onto my drab grey patio and took it all in. My backyard is exactly 60’ wide and 60’ deep. Our 5′ tall cinder block perimeter wall is the usual property division method in southern Arizona. The primary addition to the backyard was a pool which was surrounded by brown landscape rock. Flagstone was laid down as the extension of the concrete patio at the back of the house. At the back corners of the flagstone were knee high planters constructed from stackable prefab blocks. The right side of the yard was bare and needed something else. The planter looked a bit out of place and it wasn’t that interesting. I needed balance and aesthetics. Firebrick is fairly simple to explain. There is no secret to it but there still seems to be a lot of questions about it. It is a necessary material in your fireplace and it is both functional and great looking. How many customers have I spoken to asking what type of firebrick to purchase? Countless is the answer. How many customers have I spoken to asking where to buy the brick? Countless in the answer again. How many customers have I spoken to asking what to use to adhere them on heir structures? You guessed it…countless is the answer. 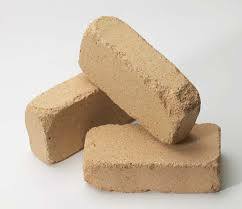 Firebrick, or refractory brick, is a ceramic material “brick” that is used to line the walls of an outdoor fireplace. The main job of the firebrick is to insulate the fireplace from the heat produced and to give you a nice-looking firebox. Firebrick will wear on the edges if not cared for before installation. Most of your vendors will have two basic sizes, 4.5x9x2.5 (full) and a 4.5x9x1.25 (split). Basically, the split is half the thickness of the full brick. The brick is very smooth to the touch and somewhat light weight even though they are solid bricks. They are machined very precise so they won’t vary very much on size. Most of the time they resemble a piece of sandstone, in that they wear down easily if rubbed on a hard surface like a cinder block. Most of your big box home improvement stores like Home Depot and Lowes will sell you firebrick but you’ll pay a premium as compared to the price you’ll pay at a small mom and pop masonry supply vendor. 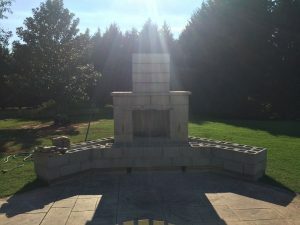 Get on the computer and search for “masonry supply” in your town or area. 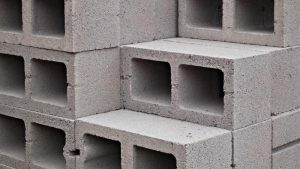 Call a few of them up and ask if they sell these specialized bricks and most of the time they’ll have a few pallets of them available at their yard. 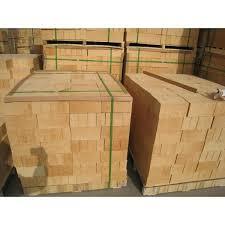 Pallets of firebrick can be found at many masonry supply stores. Your geographical area will dictate the price for these little bricks. For instance, I can buy them here in Tucson, Arizona, for approximately $1.60 each, split or full. A customer once called me and said that they couldn’t find them for under $4.00 each. He was in the densely populated New England area so I got his zip code and did a few internet searches. 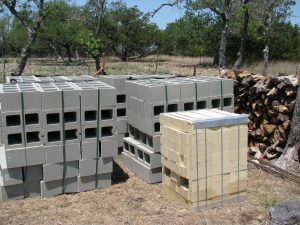 My search resulted in phone calls to a few mom and pop vendors and I found a vendor who carried the split firebricks for $1.30 each. 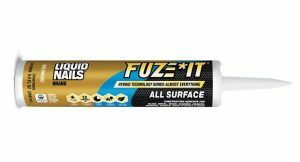 The adhesion method I gravitate toward is high heat construction adhesive such as Fuze It by Liquid Nails. It hasn’t failed me for years and I’ve built many structures using it. This method is mainly for a firebrick install that does not have mortar gaps between them. Tight packing the bricks gives you a neat look to the firebox and it is less work as they are consistently the same size. I hope this helps answer some of the firebrick questions. 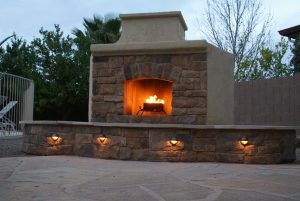 Visit us at www.backyardflare.com for more information on firebrick and the uses on our fireplaces. Thanks for reading. 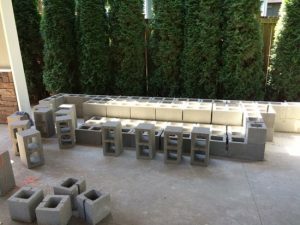 Building with cinder block is the most versatile way to construct both a functional structure and a structure with great strength and integrity. 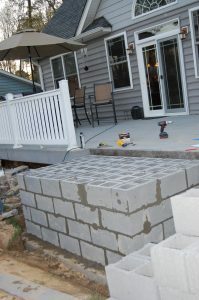 Cinder block, otherwise known as a concrete masonry unit (CMU), can be purchased at most home improvement stores such as Home Depot and Lowes. The prices for CMU at these big box home improvement stores are most of the time very comparable to local block vendors. Close to Backyard Flare, LLC here in Tucson, Arizona, is a block manufacturer/vendor named AZ Block. At the same location where they manufacture the block, you can enter the facility to buy direct instead of dealing with a middleman. This at times can make the block more cost effective for the DIY builder. Common 8x8x16 cinder block with voids. Great block for fantastic strength and structural integrity. The most common block used to build the fireplaces is referred to as a 8x8x16. This is literally the size of the block in inches. Now there is a small “but…”” involved though. The block is not exactly 8x8x16. In fact, the block measures 7 5/8” x 7 5/8” x 15 5/8”. Notice that 3/8” is subtracted from each measurement. This is comparable to a 2×4 piece of wood not actually measuring 2” x 4”. They are actually 1 ½” x 3 ½”.